Designing your own custom BP Liberator Convertible Hand Truck has never been easier or cheaper! Handtrucks 2Go brings you the best price on a Build Your Own Liberator hand truck with a starting price of just $438.99 Incl. Shipping, for the basic package. Extra charges for upgrades and optional accessories. 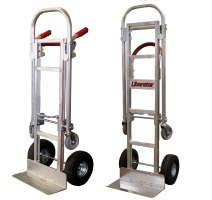 • Height as hand truck 61.5"
Please Note: The handle will only be used in upright position. Non Marking. Polypropylene hub. Extremely durable and lightweight. Weighs only 3.2 lbs each! Hub design keeps tread on, even when damaged.